Is Taiwan a U.S. Protectorate? I’ve decided to skip DealerExpo this year, but it’s almost worth going to ask Carter Bros. about their “Made in the U.S.A.” SYM scooters. (Or so reads their ad in the current Dealernews). 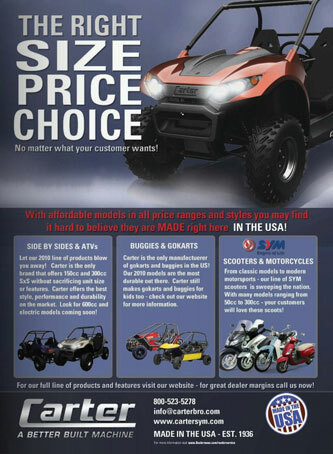 Carter’s website is more honest, reading “Carter karts, buggies, side by sides and minibikes are proudly MADE IN THE USA!,” though I’d argue potential dealers could easily misconstrue “Minibikes” as including the SYM lineup. And when I say “Most” and “Taiwan” I’m excluding the Fiddle II, though I’d still take one of those over Lance’s sad bootleg. Well, that proves it. SYMs are as American as Barack Obama’s birth certificate. Bummed you aren’t going to be at Indy. I was looking forward to hanging with you again this year. Taiwan is part of Hawai’i, now? In addition to importing and distributing SYM bikes, Carter Brothers also manufactures their own line of go carts, buggies and minibikes right in Alabama. They had stopped for some years and sourced everything from SYM, but last year they made the decision (and I heard this direct from Jonathan Arn, president of SYM when I was at Indy last year) to start up their own manufacturing operation again. I see what you mean about the ad, though – they should have had a footnote under the scooter section saying that they were imported.